Spooky stuff that will make your Sims scream! 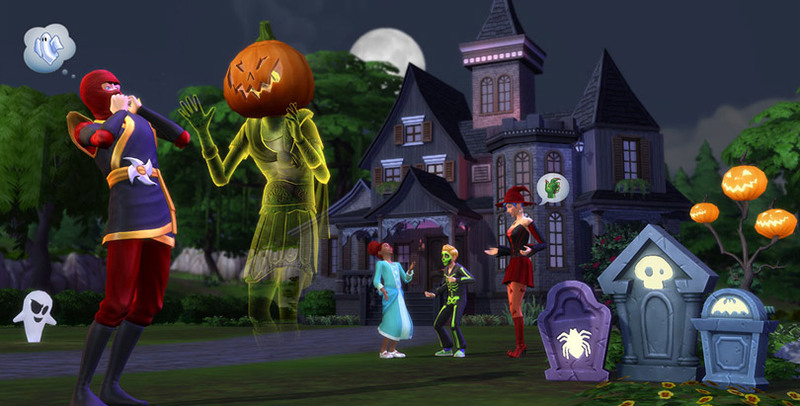 The Sims 4 Spooky Stuff Pack will turn your house into a haunted mansion. SAVE 25% on Origin! Spooky stuff that will make your Sims scream! 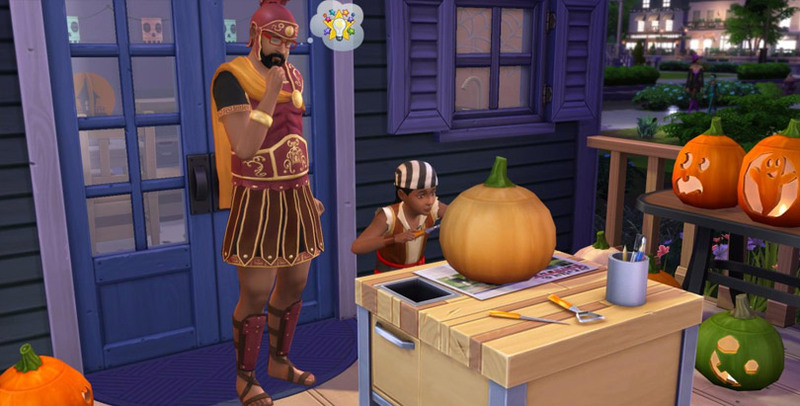 The Sims 4 Spooky stuff is mostly centered around pumpkins and contains 2 new gameplay objects. The mischievous Spooky Candy Bowl and a new Pumpkin Carving Station! 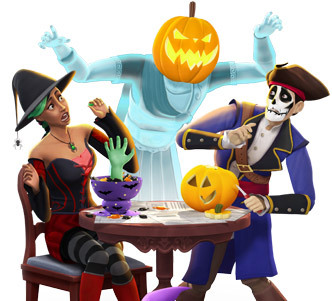 Celebrate Halloween with the new social event and throw a party with Sims wearing costumes. A new social event has been added to the options in your phone; Spooky Party. Decorate your home with all the new spooky stuff and throw a Halloween themed party. Place the Eyeball Cheese Plate, Zombie Cake, and Spooky Cookies on the table from the exclusive recipes you will get when you get this stuff pack! You can even ask other Sims for party treats (though don’t be surprised if they play a trick on your Sim instead). This stuff pack contains 2 new exciting gameplay objects. The first new gameplay object is the Pumpkin Carving Station. Make festive works of carved art by creating a happy, frightened or a scary jack-o-lantern. If your Sim has a high enough handiness skill, the pumpkin is infused with the Sims emotion. 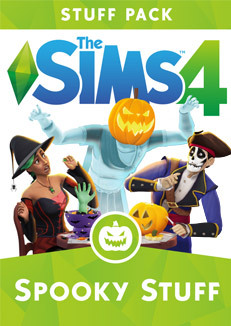 Place a candle in the jack-o-lantern or put it on your Sims head and start haunting the neighbors. And if you didn’t like the result, you can smash the pumpkin into little pieces. The second gameplay object is the mischievous Spooky Candy Bowl to scare the guests a little. Make your haunted mansion a bit more interesting with all the new creepy stuff! Enjoy the new paintings, spider webs and the tattered furniture. This stuff pack has amazing new objects to lighten your home and spooky wall painting designs to make the perfect room for the perfect scary party. Always wanted to make a graveyard without killing all your Sims? this pack comes with decorative tombstones! There are a lot of glowing objects like an animated glowing cauldron, decorative ghosts and a lot of festive jack-o-lantern objects. Dress up your Sims with new costumes; Fairy, pirate, witch, tattered clothes, superhero costumes and even ninja outfits! Kids can also wear new costumes and dress up like a skeleton or a princess. All the costumes come with a complementary hat. New Party type; Spooky Party. Carve Pumpkins on the Pumpkin Carving Station. 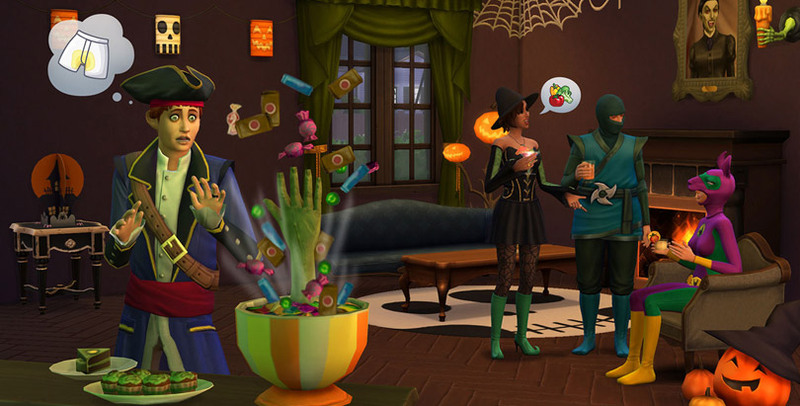 Scare Sims with the Spooky Candy Bowl. Exclusive new objects like decorative tombstones. Unique new costumes to dress up your Sim. This pack looks so cool. Can’t wait to put it into my game. EA used to give away specialty holiday stuff packs. After seeing what they’re trying to sell for 10 bucks, I’m pretty confident that’s the only way “Spooky Stuff” would wind up in my game. I used to really love EA Sims games. Although the Sims 4 was far from perfect, I waited until they fine-tuned and added some things before I bought it, I had hope. But they’ve just taken a completely different direction. First we had to pay for Jacuzzi’s and now holiday packs? All of this stuff used to be free. So now you add a few extras and a trailer and it’s ten bucks? Don’t get me wrong, I know a lot of hard work goes into this stuff…I just feel like you guys are back tracking. I dont really know why people are having a whinge over ten bucks, this is a great stuff pack. Im still trying to work out a few things, but I can see Ill be there for hours now. lol.